Here we describe how to use SMSEagle for EventSentry SMS notifications. 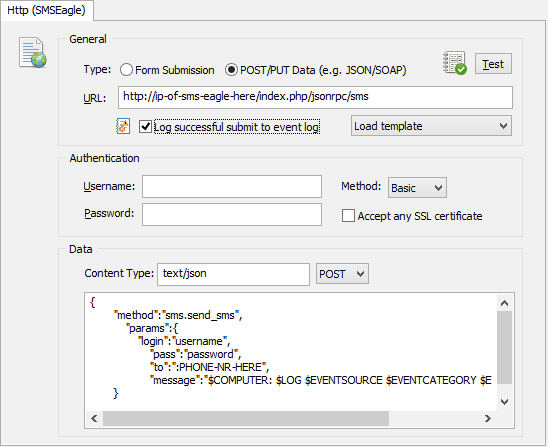 See more about Eventsentry and SMSEagle also in this Eventsentry blog post. The HTTP action includes a number of templates to quickly load all required fields for a specific HTTP API. Select the SMSEagle from the Load template drop-down and specify all the required fields (host IP, user and password to SMSEagle, phone number). Use the test button to ensure the action is setup correctly. Once the action is setup it can be referenced by one or more filters so that it is triggered under the right circumstances. 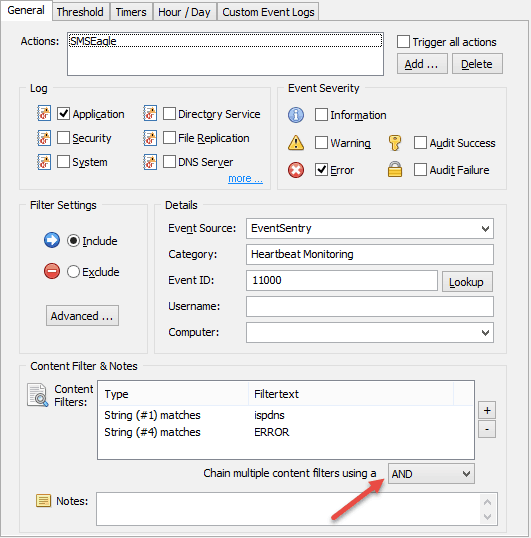 Here, we are looking for an application error generated by the Heartbeat Monitoring category of the EventSentry source. We’re also further restricting the filter to only alert us on status changes of the “ispdns” host when it goes off-line. Since the SMSEagle is listed as the action, this particular event (alert) will be sent to the SMSEagle action. The insertion strings can be determined by either clicking on the “Lookup” button on the filter dialog, or by clicking on the “Preview” button when adding a content filter.